Recently I have been exploring the common archetype of the princess in the tower, in relation to my life. It is something that crops up from time to time, when I feel helpless or overwhelmed; I feel out of control, like a small child, powerless and desperate; I don’t think I can do things by myself. Whenever this pattern emerges I secretly wish for someone to rescue me, when really I know I always have to rescue myself. Please excuse the gendered nature of the archetypes presented here – they actually don’t need to a particular gender, that is just the common representation… I do feel, however, that growing up without a healthy father figure/male role-model has stunted and warped the development of my animus, which I have been progressively healing/growing back over the last few years. The animus is commonly known as the ‘male’ or masculine part of the psyche, but is also associated with the warrior or rescuer archetype. If you didn’t have a present or adequate father/male role model, you may well be in the same boat. Early on, we who need to rescue ourselves tend to fall into the trap of becoming the rescuer – of being attracted to wounded puppies who we think we can save with our love and guidance. This is a massive exercise in projection and gets quite circular. We are seeing our own damaged animus reflected back through damaged people and damaging relationships. Without a healthy animus, we are doomed to repeat this cycle. The good news is that, eventually, we can heal the major inner fractures in ourselves (if we need to). We can piece one together from the aspects of healthy ‘masculinity’ and strength we encounter in our lives. We can make a frankenstein animus and bring it to life – or re-grow an under-developed animus archetype until he reaches maturity – along with culling all the unhealthy/predator/shadow aspects we may have internalized from having painful or exploitative experiences with men. Even when we have cobbled together a healthy representation of animus inside ourselves, we may find that we still feel tensions and anxieties arising from attachment and relationships – even with healthy significant others who are not wounded puppies. While being attracted to healthy (rather than damaged) people is a sign of significant healing progress, it doesn’t mean it’s all smooth sailing from here. Our new healthy animus still needs to be socialised. Invite him to sit down for a cup of tea. Build a good relationship with him. If you are projecting anxiety onto an external attachment, transfer this projection, along with your needs and desires to your inner animus and practice relating to this inner ‘other’ in a healthy and loving way. He can be there for you, love you, support you and rescue you in an insecure world. Through this inner transformation, the external world can mirror harmonious relationships back to you. Many stories begin with letting go: one must let go of the safety of one’s home to adventure into the woods, a sacrifice is made, the protagonist surrenders their dreams only to rediscover them later, the good parents must die in order for the transformational journey to begin. There are so many stories of orphans (or half-orphans) – the Little Match Girl, Harry Potter, Hansel and Gretel, Cinderella, Vasilisa, and so on. Aside from the fairy-tale romanticism with orphans, there is a necessity involved in the death of the ‘too good’ mother, as Clarissa Pinkola Estés calls her, and sometimes the ‘too good’ father as well. The safe world created and maintained by good parents is torn away and the story really begins. If you came from a safe, nurturing family, there is a point at which you are likely to break free of the comfort zone and begin your own journey. Internally, you let go the ‘too good’ parental archetypes, they have become suffocating in their love and you need room to grow. Just as Maui split his parents apart, you crack open the protective world of childhood and emerge into a more dangerous place with more opportunities for suffering and learning. This is the process of the bud blooming into the flower, the seed sprouting. After a while the safety of the shell gets to be too restrictive, the pressure build and a new metamorphosis must occur. If you had a tumultuous childhood, however, you may not know where to start. 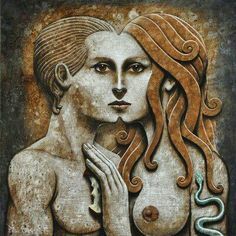 If you didn’t get enough of the ‘too good’ mother or father archetypes there is no pressure of safety to break free from, just a yearning for love and nurture and comfort. If there are no parents with the ability to meet your needs now you may turn to friends, lovers or various addictions, no doubt repeating the same insecure attachment patterns you grew up with. To begin the journey you must let go of the ‘too good parents, but how can you do that if you don’t have them to begin with? It is possible to cultivate the nurturer archetypes in oneself. I believe it takes practice and repetition – visualising and imagining what that delicious safety must feel like, the warmth, the love, the unconditional nature of the bond. Hold it, feel it and then let it go, bearing in mind that none of the fairy tale orphans wanted their good parents to die, but they all had to let go of the ledge to experience free falling. There is mourning here, because with loss and life shattering change there is always grief. If you grew up with insecure attachments to your primary carers you experienced that loss over and over again and developed protections against it. You may be chronically tired – chronically mourning the loss you suffered repeatedly, continuously. It is perhaps similar to re-living a nightmare every night. With every new attachment comes piercing anxiety for the inevitable loss. Perhaps you avoid attachments all together, or chase them, or perhaps you have closed off against the pain. Either way, acceptance is always the best medicine. Of course, I speak from personal experience, and in exploring this archetypal journey I’m treading on my own damaged emotional nerve-endings. This is an attempt to re-wire my brain, to heal my damaged or under-developed archetypes and to move past the acute pain. I have transferred my often unmet childhood needs for love, attention and nurture onto lovers and particularly nurturing friends, repeating the same painful cycle. It is so hard to cut yourself off from people you feel you need. It is a terrible sacrifice to let the ‘too good’ mother die, but one that is necessary in order to break out of the dependency cycle. I suppose it’s a bit like psychological weaning; it creates the space for solid sustenance and growth. A wise woman once told me that the psyche is a lot like a wall: if the bricks aren’t laid properly at the foundation, it doesn’t matter how many bricks you build up, the wall will always be wonky. Now, I have a great appreciation for wonky things, but when it comes to my psyche I would prefer it to be strong and resilient. Most of all, I would love to be free of the feeling that there’s something wrong or broken that needs to be fixed. Apparently it’s possible – all you have to to is deconstruct the wall, brick by brick, fix the problem at the foundation and then you can build yourself a strong, stable wall. The wonky bricks might come from a number of things: childhood trauma, neglect or needs not being met. I have been slowly processing my traumas as they emerge, and I am getting good at recognizing them when they’re projected on to other people close to me. I can tell because when trauma is triggered I get intensely emotional – angry, sad, scared – in a way that outweighs reason. The more awareness I build, the more I can move on. But it’s not only trauma wonky-ing my wall, there are a few bricks missing. One of the main things I have (recently) realised about my childhood is the absence of good male role-models. People often worry about the lack of male role-models for boys, but rarely do they consider them for girls. How are we to draw a healthy animus (male part of the self), with no artists model? I grew up with a tyrant of a step-father, a dad who lived far away, no close uncles and a distant (but kind) grandfather. It’s really no wonder that as an adult I have had so many bizarre, and not-very-healthy relationships with men. So, bearing this in mind I have been embarking on a journey to re-construct a healthy animus. Externally, I have built good friendships with psychologically balanced and self-aware men. Internally I have worked with archetypes – the father, the hero/rescuer, the lover. I have even started to see this work reflected in the outside world – for example, I have actually started getting appropriate crushes on healthy and well-rounded men for a change. I don’t know much about this, really, but apparently Jung talked about different stages of development for the animus archetype. The first is very physical, progressing through to psychological and spiritual awareness. At the moment, my animus is still in a petri dish, but it’s growing – and it’s healthy – and it’s a breath of fresh air. In my previous post about the predator archetype I didn’t go into the back-story of this universal archetype. Of course such a dark character must have a story. According to Estes he is a fallen magician. A personification of the psychopathic wounded ego trying to be more than one is. Icarus flew too close to the sun and suffered the consequences and the this damaged part of the psyche over-extended in a similar way and exists in a state of permanent over-compensation. On a personal level, the predator is a fragment of the shadow: the part of ourselves seeks redemption in all the wrong places. It has lost its own light and plots to steal the light of the psyche. It is our internal psychic vampire, pilfering our creative potential, holding us back with fear. This archetype offers a warning against the reckless pursuit of power. On a wider social level, this archetype makes easy prey of women who have been trained since infancy to ‘be nice’, it seeps out of advertising. In the West it is disguised as the freedom to choose to be exploited, in more conservative cultures it is the invisible dominating force that women hide from. Some people seem to unwittingly personify this fallen magician archetype all too well. I have met a few people who have tried to pursue the occult for power, either favoring hierarchical traditions or claiming to be far too unique, too special, too powerful to follow others. There was always something odorous about these people, something of the rodent in their appearance, a dangerous kind of cunning.